Just put out an update with some key quality of life improvements and a new feature I'm quite proud of - Vehicle Notifications. 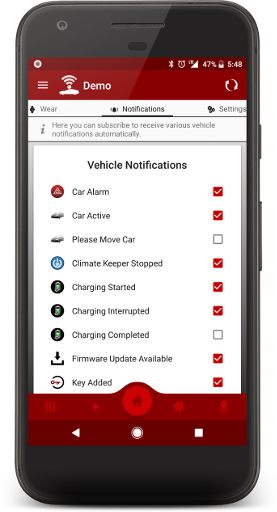 You can now opt-in to automatically receive any number of vehicle notifications of your choosing akin to the official app, albeit with more flexibility. For a detailed explanation, I reverse engineered the official Tesla app's push notifications so Dashboard for Tesla perfectly emulates the vehicle notifications feature only with less restrictions and more cool things to come - such as automatic behaviors tied to a vehicle notification! Items marked with an * indicate I am not positive on what they are for and can only guess. Feel free to speculate with me below. In addition to the above notifications, there are a number of urgent notifications you cannot opt-out of receiving - such as summon panic failure, or charge tapering. I could add support to silence (AKA not show the notification) these in the future if enough people would rather not see them pop-up, but just know your device will always technically receive these push notifications over the network for your subscribed vehicles even if I weren't to show it as a notification. In case you haven't found them already, there have been a few other changes made recently that haven't been mentioned in a release post I'll list here. Wear Summon - I mean it this time! Thanks all for your support, let me know if you need anything. I love the functionality! I especially appreciate the Smart Charging feature. I couldn't figure out how to submit a bug report so I thought I'd post here. This doesn't cause any issues but it seems that it would be more refined if the calculation results in negative values that you just bail and don't do anything? Hey marcdcmb, thanks for your support! You can always submit feedback through the app from the About screen or dialog, or email support, or message on the forums here as you've done. To your issue, great find and good reproductive steps! I'll try to reproduce it myself and get a fix out. It's likely an oversight and I agree, a fix would be to do nothing. The calculation is going negative as it expects the current SOC to be less than the desired SOC causing the start time to be in the future. The SSL errors seem unrelated, those tend to happen when going through workplace WiFi that has network policies in effect that restrict your internet connection. If this is the case, your device is communicating directly with Tesla's servers which may or may not be allowed on your works' network, so there's not much I can do about SSL errors. If this is the problem, I suggest you try troubleshooting it to get it to reproduce and go from there.